Flavor: Citrus, pine, resin, tropical fruit, loaded hop nose from heavy Mosaic and Simcoe dry-hopping. Full bodied with hop bitterness and resinous hop flavor. Leaves a lasting impression. Citra: heavy citrus aroma, fruity flavor; Chinook: grapefruit, resinous pine; Simcoe: dry, piney; and Mosaic: earthy and mildly floral, with notes of sweet citrus and spice. Honestly would be hard pressed in my opinion to find a better double IPA. Fantastic hop kick and very smooth. I go through cases of this since it is easily available here in Philly area. Because perfection is hard to come by, I have to go with a 4.75 overall.....but as I wait for the perfect beer, this is as close as it gets for me. Best tasting IPA out there and I've tasted many. Out of 7 billion ppl in the world and each having an opinion, mine is this is the best IPA out there! After reading the reviews this popped right into my wants. Then on a lowly day when beer shopping my phone died, unable to turn to BA for advice. With no particular wants in mind I picked this up, read the description on the side and knew I had to try it. This ended up as a want twice and for good reason. Smells and tastes primarily of citrus, mostly grabbing grapefruit and apple, surprisingly brings a brisk spice aspect once the pine comes forward. Aftertaste is dry and suitable to taste. Mouthfeel is crisp with biting carbonation. So easy and pleasurable to drink, my new personal go-to. Poured into a Dogfish Head IPA glass. A - 3.5 - Pours a clear gold color. Forms up a finger of bright white colored, dense head. Medium/low head potential, high head retention, spotty lacing. S - 5 - Extremely wet, juicy and dank hops, bittered, more savory aromas of pineapple, mango and grapefruit rind. T - 4.75 - Once again with the dank hops, lightly sweet pineapple and tangerine, ends on a nice, medium/strong bitter finish. F - 4.75 - Nice medium/thick, creamy mouthfeel. O - 5 - What an awesome example of the double IPA style. This DIPA is deceptively smooth and sessionable and doesn't fall victim to the loss of bitterness and malty syrupy sweetness that most double do. HIGHLY recommended to fans of the style! I've over looked this one probably a hundred times at my local craft shop and had no idea about its critical acclaim until I happened to stumble upon it on here. Since it isn't a massively hyped $8 bottle, I can assume the ratings shall not let me down. At least I hope not. Look - Pours a moderately deep golden with a two finger white head that sticks around throughout the entire glass. Carbonation appears high and is even giving me the illusion of a cyclone going on in my glass. Bottle is quite attractive as well which is a slight bonus for this category. Leaves spiral lacing all throughout my glass. This category would get a perfect score if the beer would have been a bit darker. 4.75. Smell - Y'know how people mention the word ' dank ' with some beers? With this is about as dank of a nose as you could possibly get. Nicely balanced centenniel hit on the forefront and quite floral and leafy. Fruit juices that I can't quite put a finger on. Earthy with just a touch of dirt. 4.75. Taste - Ever have a beer follow the nose to almost a perfect T? Well this is pretty much that. Centenniel hops stay light to medium with a burst of grapefruit juice and floral aspects followed by the earthiness and just a touch dirty, which makes things more interesting as it kind of compliments the other flavors in a way. 4.75. Feel - Light and creamy bodied due to the retained head with less carbonation than I had expected after the show it put on in my glass. Swallos easy as can be for the percent. 5. Overall - Dangerous stuff right here. Drinkability is second to none. Has all the flavors you want in a DIPA without being one sided. Surely not malt heavy. The earthy edge is a bit weird in this guy, but other than that, this is still one of my favorite beers of all time hands down. Could drink morning, day or night, spring, summer, fall or winter. 4.75. Smells amazing, big grapefruit and lemongrass notes, fruity hops, and pine. Really complex nose probably due to the 4 different hops used. Balanced out nicely with a sweet malty smell. I could just sit and smell this all day long. Taste is huge on hops, but not throat burning. The grapefruit gives way to pine and malts. Aftertaste is great. A must-try for any hop lover. Thoughts- I've had this many times over the past few years and it never ceases to amaze me. I have had some fluctuations in clarity and sometimes in taste, but still overall one of the finest beers I've ever had. Finally getting a chance to tick this. Enjoy by date 12/5/16. 12oz bottle into 10oz goblet. Poured a lightly hazy deep yellow color, with about 1/2 inch of white head that had light-moderate retention and light lace. The aroma did have an aspect of musty dirt, close to the dictionary definition of dank in fact. Hop forward, with a light malt scent in the background. Taste was the same musty, earthy, mildly funky. Body was light-medium, with a mostly dry finish. Drinkability was a bit of a chore, due to the basement dank. Overall, I didn't miss anything with initial hype this beer received. Go ahead and tick it if you haven't, but you haven't missed anything. This is easily the best IPA/DIPA I have ever had. Victory did a wonderful job with this DIPA. 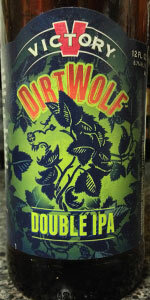 IPAs are not usually my top choice, but DirtWolf is a great introduction to the IPA family. The nose is strong as you would expect, but profile is slightly less intense. Certainly a drinkable IPA and a perfect choice for a newcomer to the IPA world. Eww, like licking a pine cone mixed in a pool of bitters. I won't be drinking many IPAs, I have taste buds unfortunately. A softer gentler IPA. In a land of harsh extremes, this IPA offers the assertive bitterness we expect from the style without the mouth pucker. It feels like a session IPA until you pay the piper as you finish it. I just wish o had a mound of BBQ brisket to enjoy alongside it. I highly recommend this beer. Strong pour yields about a finger’s worth of cream white foam, more or less even surface, a few larger bubbles, has good retention of what’s there, the lacing is more like a thin, consistent webbing than thicker streaks. Coppery colored liquid, neither shiny nor dull, somewhat translucent as well, very few visible bubbles. The nose has a good amount going on, lots of pine and grapefruit, tangerine citrus, peppery, leafy without seeming green, the fruit is tropical pineapple, nectarine, mango with apricot, more edgy than wet and juicy, for the punch it packs it also possesses a sinewy, punctuated dissolve. Full-bodied, sappy and heavy in mouth feel. here too leans on the pine, citrus and herbal matter for the cornerstone of flavor. Not that floral but has a patina of malt sweetness and brioche style breadiness. Mango, papaya, pineapple, nectarine, apricot fruit bright and succinct at once. A touch boozy but no heat in the throat. The stickiness prevents it from being a thirst slaker but that is clearly not the intent. Big, bold and proud of it. A: A light colored DIPA that is a deep golden beer with good clarity. The white head is quick to fade into a thin cap of soapy bubbles. S: A strong citrus hops aroma that mostly has notes of grapefruit, pine, some pineapple and a fair amount of an herbal character. There is a light malt a sweetness and a low alcohol sweetness. T: An aggressive hops bitterness and a very strong citrus hop flavors. The hop flavors are a lemon/lime, pine, some mango and little citrus zest. There is just enough malt for support and nothing more making for a very bitter balance. The finish is off-dry with a lingering, citrus hops flavor and bitterness. There is some herbal qualities to the hop flavor that is more apparent towards the finish. M: A medium bodied beer with a light creaminess and a strong level of carbonation. O: A very well crafted Double IPA that brings a ton of American citrus hops to the party. The entire focus and balance of the beer is out towards showcasing the hops. A very good IPA. I prefer this one from the bottle. Even with a relatively careful pour, the lively brew overflows the IPA glass with steady, slow rising carbonation. The end result is a staggering whipped cream-like head that mounds over the top of the glass, adorning a golden honey colored ale. It's a little lighter than I expected, and the color and clarity afford a great view of the myriad particulates that are suspended in the liquid. After a good while, there is still ample foam retained, and lovely lacing on the glass. This one looks like it belongs in a commercial. The aroma is incredible. Dank, earthy and aromatic. Very bright and floral. A bit of pineapple and tropical fruit flair. Absolutely luscious! The first sip is an explosion of complex hop character. Tart earthy spice, minty pine and citrus zest. Artfully balanced with just enough malt sweetness to play along, without becoming cloying. The alcohol is well hidden, so despite a cumulative booziness on the breath, it's undetectable. The mouthfeel is juicy. Exceptionally fresh and lively. This is hands down one of the best double IPA's I've ever had. Nothing is to excess, but it is brimming with complexity and character. I would be happy just smelling this beer. Fortunately, the look, taste and feel are up to the challenge too. This is a marquee example of an American IPA and what passionate brewing can produce. L: pours light gold with 1 inch thick white fluffy head. S: Great citrus - Victory knows its hop combos. T: Incredible - once again a nod to Victory and its hop knowledge. F: Light carbonation, slight dry finish. Decent hop burn. O: Another great on from Victory. A wise man once said: “In the land of countless Double IPAs (aka America) the best hop balanced beer is king.” [that wise man was me btw] It is armed with this foreknowledge that I approach one of the most highly rated DIPAs with trepidation, I mean it’s not every day you get to sup on the fine nectar of the hopped potion known to men and gods as ‘beer’ (let’s not forget woman too - or woman deities such as Ninkasi the Sumerian goddess of beer - cheers to equality Doc!). DirtWolf - the name even sounds like an 80’s TV series based on a stealth helicopter, YEAH. A: Cloudy straw/pale amber body with a massive 2 inch white head that soon settles to a half centimetre lace - it might have been shaken but it was never stirred... damn those Bond puns sneaking in due to the upcoming Spectre film. Pale colour for an IPA, but decent nonetheless. 8/10. S: Hops so fresh you’d think that they were picked yesterday. Bold grapefruit and herbal hops with a hint of tinned pineapple chunks - this is one chunky and delightful perfume you have Mr. DirtWolf. Background notes of a solid biscuit and orange candy malt base provide a foil ensuring the hops don’t completely steal the show. This is an A+ DIPA aroma. 10/10. T: All of the above comes to life and dances an Irish jig on my tastebuds. In the immortal words of Ken Griffey Jr. "There's a party in my mouth and everyone's invited" - only this one delightful concoction that won’t give you an extreme case of gigantism. Overall a touch on the sweet side, however if you’re over the OTT bitter DIPAs (like I am lately) this is a fresh approach that will leave you wanting another bottle (or a case in my instance). Ooo, hint of cracked pepper in there as well, damn DirtWolf - you be FINE! 10/10. M: Medium bodied with a medium carbonation, a spot fizzier than I’m used to with this style, burps were forthcoming. 8/10. D: Doc’s new favourite DIPA (or IPA for that matter!) right here. The only big negative I could come up with is: finishing the bottle. Damn I have one more left and Plonk (whom I convinced to get this in) are completely out of it now. Oh well, savour this sweet syrup while you can, life is short and then you die and get reincarnated as an obscure cartoon character [FYI: I’m starting my own religion “Toonism”]. Anyway, not relevant! Superlative brew. 10/10. Food match: This a heavy brew treat it with light fare: Vietnamese, Thai, Indo, etc. Poured from a 12 oz best by Oct 20. Nice golden straw color. One finger foamy head that dissipates slowly. Moderate retention and lacing. Smell of tropical flavors citrus grapefruit pineapple. The taste concurs with aroma with bready finish. Decent carbonation. 8.7 percent hidden very well and a balanced beer. One of my favorites! Cheers! Citrusy IIPA. Victory just doesnt make bad beer. As a fan of the Mosaic Hop this is a no brainer.. I can always detect citra and mosaic before all others and this dipa is competent it brings the decent hop punch I crave ,as an avid fan of Clown Shoes Space Cake, Dirtwolf delivers it has a slight sweetness with a robust mosaic and citra punch. I would recommend this beer to Double Inda Pale Ale fans it's refined enough to enjoy with dinner but pungent enough to keep your attention on a Saturday night. So if you crave mosaic you gotta try this. This is my first victory brew and I'm excited to try more. Absolutely enjoy this beer, but not really picking up on the Double IPA. I think it's a world class IPA. Double...I am not so sure of. Would be a perfect IPA out of the can. Nice IPA nose; Beautiful straw color in appearance; Very noticable bready hops. Citra fruity, Simcoe punch.